This weekend Destination D has been packed with a ton of announcements and new details about upcoming projects at the Disney Parks and Resorts. One of the many exciting reveals to come out of this weekend was Chairman Bob Chapek sharing a sneak peek of the upcoming Disney’s Riviera Resort. This new concept artwork gives us a better idea of what the outside of the new Disney Vacation Club resort will look like. The concept artwork shows the pool, what looks to be a hot tub, the surrounding landscaping, the resort itself, and fireworks shooting off in the background. 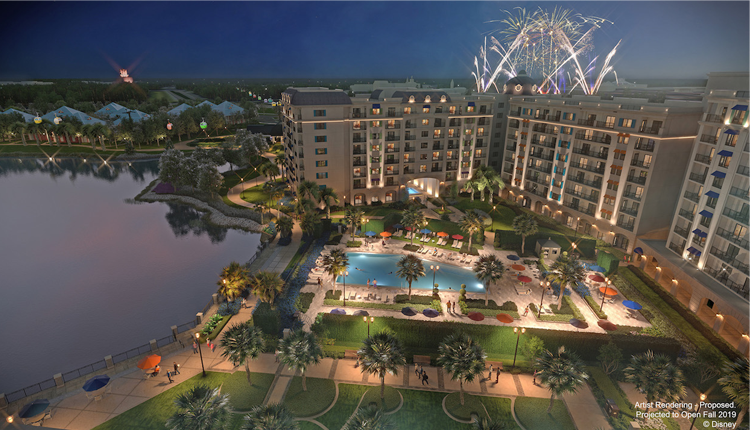 This image confirms that some guests will have a great view of the fireworks from their hotel room. Also, featured in the concept artwork is the Disney SkyLiner, which will have a station at the resort.